- GE2011 WP candidates witnessing the securely sealed ballot boxes transferred from the Supreme Court to the Tuas South Incineration Plant for destruction. Thanks to the great efforts and efficient Returning Officers, Police officers and volunteers. Towards a First World Parliament! World renowned top medical researchers Copeland and Jenkins leaving Singapore, this couple is the hope of tackling cancer, not far from a major breakthrough in this field, genuine foreign talents. Heard from some common friends of the story before ST repo...rted yesterday. A very sad day and big lost to Singapore. A renowned oncologist at SGH and his wife a NUS professor specializes in nano tech migrated to Australia 5 years old ago ~ reason tired of their school kids struggling to cope in our very competitive school system. I wonder how a competitive school system can produce talents and promote innovation in our society, hope the Copeland and Jenkins is an isolated case, not we are unable to retain foreign talents after spending billions $ to bring in more than a million of so call foreign talents! Take calculated chances, make mistakes. That's how you grow. Pain is the engine of your courage.The difference between a successful man and a failure is not one's better abilities or ideas, but the courage to apply his ideas, take a calculated risk and to act. There are quiet leaders and leaders are more ready to listen. Some find strength in eloquence, some in judgment, others in courage. 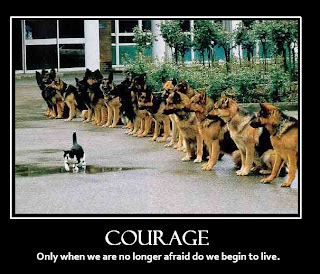 Above all, leaders need to be courageous. Selamat datang dan selamat malam. Bahasa melayu saya kurang fasil. Nama saya jalah John Yam. Saya bawah kumpulan cahlon berdiri di Nee Soon GRC. Saya minta sokong tuan-tuan Dan puan-puan. Ke arah parlimen dunia pertama. Welcome and good evening my dear fellow Singaporeans. I am John Yam, WP candidate and leader of the Nee Soon GRC team. The issue I'll be dealing with this evening is our education system. I will briefly speak in Mandarin, follow by English. Parents and pupils, are you by stressed by our school system? Are we spending too much time and money on tuition for our children? We believe this is due to MOE agressive streaming, done at too young an age of our pupils. Branding and ranking of schools. Teaching staff are overly KPI or (key performance indicators) driven in the MOE system. This contributes to the highly stressed school system. All these are due to our elitism in our education system. what more down the line for the students? How successful is MOE compare with the other countries? Canada may not compare well with the Singapore in world ranking. Canada has produced 18 Nobel Prize winners, 44 Olympics medalists, plus hundreds of world-renowned entrepreneurs. writers. Even Hong Kong and Taiwan managed to have at least one Nobel Prize winner, many Olympic medalists and entrepreneurs. Israel does not enjoy the higher ranking like Singapore. Rank among top globally in medical research, as well as defense science and telecommunication technologies. To date, Israel with a population of only 7.5 millions, produced nine Nobel Prizes, astronauts participating in NASA Space Shuttle Mission. We, as parents are so stressed up under such a competitive system - in order to cope, we are sending our children for tuition classes. Not surprising, tuition is fast becoming a billion dollar industry, in our country. Practically, smaller class size ratio, improving English grades with declining command of English at work, expensive quality childcare, the discriminating, widening gap between scholars and non-scholars in civil service career, is producing YES-men policies - narrow and more of the same, grades being a life-time stigma and punishment as MISTAKES, with no second chance - this is weakening out social fabric, making the nation POOR IN SOCIAL CAPITAL. When you apply for a government job at 40 years old, you will be scrutinized and condemned for poor O Level grades decades ago. You are punished. This is a cold and harsh system. Very cruel for young late starters in life. Even true blue elites like Mr Tan Jee Say, becomes trash in the mouth of his ex-boss in the civil service, once he's NO LONGER a YES MAN! - to be socially responsible, morally righteous as well as creative and innovative citizens. Not just exam smart pupils, with good grades that secure places in branded or elite universities. PAP attacks our candidates lack track records. Based on such argument, does it mean SAF never go to war is incapable of defending and protecting our country. Do you believe we will ever have more good years under the PAP political monopoly. Are you confident we will ever attain Switerzland standard of living. Very clearly, if the PAP is once again voted in, without significant opposition representation, it will be more of the same - the much needed changes that many Singaporeans look forward to, will not come. Today, we have attained Switzerland cost of living but not the standard of living. Latest UBS research on purchasing power, Malaysia is ranked higher than Singapore. Did Singapore gotten into the last world cup quarter finals? Who made the promise to us in the 1990s of more good years. Today, we don't have more good years but only more, GST, ERP, very high COE, street gangs and moral issue behavior in our society reported every other day. Clearly, it is time for change. Welcome! My dear fellow Singaporeans It's my honor to share my political beliefs and vision with you this evening. I will begin my speech with a brief greetings to my Malay friends in Bahasa Melayu, follow by Cantonese and Mandarin. The remaining part of my speech will be in English. Good evening, I am John Yam Poh Nam, WP candidate for the Nee Soon GRC. Are we better off now compared to five years ago? With a GDP growth of 14.7 percent last year, which is mainly contributed by the opening of the two casinos, how many new jobs have been created for us Singaporeans. I challenge the labour minister to provide us the statistical breakdown here. How many jobs are actually created for Singaporeans. Please do not lump up the employment figure of Singaporeans and PRs! We need more transparency here. The ruling party is importing another 80,000 foreign workers. Many of our loved ones, especially those who are above 45 years old - are facing difficulties in looking for jobs. Is our public housing truly affordable, as what the ministers claimed. Perhaps only for the top income earners. With the escalated HDB flat prices, we will have little saving in our CPF on retirement after paying our housing mortgage. This is a very critical issue for our children & the younger generation, especially those who are planning to start their new families. Yes, HDB flats was an investment for Singaporeans 15 years ago, but not anymore today. The suppressed wages many Singaporeans are facing, job competition caused by the overly liberal and problematic immigration policy have made life really difficult for Singaporeans. Our frustration that come from the very real problems, such as the rising cost of housing, overcrowding of public transport, increased competition for jobs from foreigners and the long hours of work and stress. Singapore has the poorest productivity number not only in Asia but worldwide. Average productivity growth across East Asia and the Pacific in 2009 was 2.4 per cent, and minus one per cent worldwide. According to CIA (Central Intelligence Agency) 2009 public debt country comparison, Singapore rank 6th. We are behind Zimbabwe, Jamaica, Lebanon. The labour movement by NTUC promotes Singapore ecomony and workforce to be Cheaper, Better and Faster instead of value add, continual improvement of work process and efficiency. It also contradict with the ruling party justification of high pay and transformation. Based on Mr Lim Swee Say campaign of "Cheaper, Better and Faster", does it means that the ruling party will take the lead to reduce their salary so as to be cheaper and better. Clearly, the quality of the present cabinet minister is definitely not better than during the time of Dr Goh Keng Swee and Mr Ong Teng Cheong, as to deserve such high salary. Why PAP did nothing for 5 yrs and now $600 mil upgrading before Elections? Whose money is that? PAP money? Will PAP deprive Nee Soon voters of $600 mil if PAP loses the Election? Please make this very clear to ALL Nee Soon voters. PAP owes them the answer! PAP runs this nation like a company. The public service organizations under the PAP are too carried away and overly profit driven. PAP is making Singaporeans pay more and more - GST. ERP. COE. By voting for PAP, do you think public housing will become more affordable? Do you think train and bus rides will be cheaper? The costs of living will be lower? Foreigners won't squeeze Singaporeans out of jobs and schools? Do you believe we will have a better future? free, more caring and more prosperous Singapore. Towards a first world parliament. Say NO to rising HDB prices. Say NO to higher costs of living. Say NO to poorer quality of living. Say NO to foreigners squeezing Singaporeans out of jobs, schools, trains and buses! To all my foreigner friends. I assure you we are not xenophobic, we are not against you. We are fighting for the basic rights of our fellow Singaporeans. Say YES to your voice in Parliament. Say YES to check and balances. Say YES to a better future for Nee Soon and Singapore. Say YES to the Workers' Party. 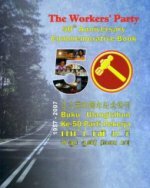 Vote for the Workers' Party on May 7! We share your belief when there is competition, there will be progress. Grant us the honor and mandate to serve you. Together, we will build a better tomorrow, towards a first world parliament. Vote us all WP into the parliament. Thank you. 谢谢大家。Terima Kasih.